“We have failed to recognize that arming militias and manufacturing a mercenary army under the banner of the dollar would only exacerbate disunity and ultimately play to our disadvantage,” one expert tells MintPress of the international community’s failings in Libya. 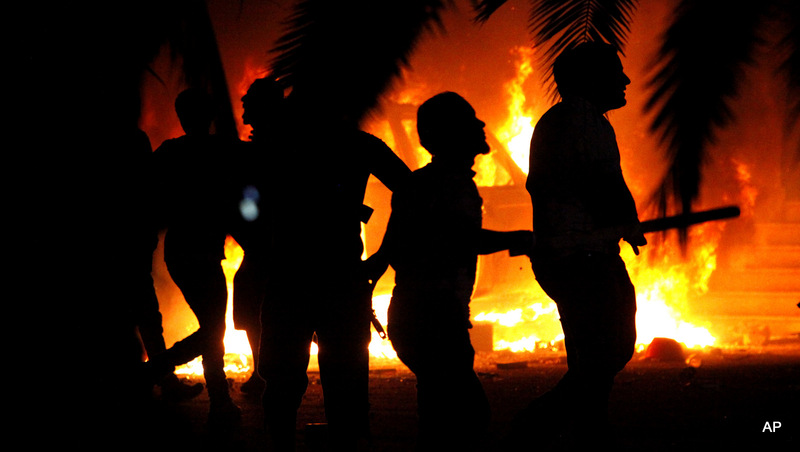 Libyan civilians watch fires at an Ansar al-Shariah Brigades compound, after hundreds of Libyans, Libyan Military, and Police raided the Brigades base, in Benghazi, Libya. Factions of the group in 2014 pledged allegiance to the Islamic State group. Libya, virtually a failed state the past years, has provided a perfect opportunity for the Islamic State group to expand from its heartland of Syria and Iraq to establish a strategic stronghold close to European shores. With global attention focused on Iraq and Syria, Libya was left to convulse under the weight of its own brand of political instability and insecurity, yet another failed Arab Spring state. Of course, mainstream media watched and reported as Col. Moammar Gadhafi’s regime crumbled under an unprecedented, violent popular armed insurgency in 2011. That attention, however, was short-lived and fleeting. Libya came back into focus on Feb. 14, when Islamic State of Iraq and Syria (ISIS) militants published a gruesome video, “A Message Signed in Blood to the Nation of the Cross.” The five-minute video shows ISIS militants simultaneously beheading a group of 21 Egyptian Coptic Christians, who had been abducted in Libya earlier this year. With ISIS now inserted into the mix of Libya’s unravelling, the country is back on the forefront of the war on terror. Two days after the video surfaced, Egypt’s Ambassador to the U.K. Nasser Kamel told the BBC that ISIS would attempt to break into Europe by exploiting conventional migration routes, camouflaging its fighters within the waves of illegal migrants pouring toward Western capitals. “[There are] boat people who go for immigration purposes and try to cross the Mediterranean. In the next few weeks, if we do not act together, there will be boats full of terrorists also,” Kamel warned on Feb. 16. Likewise, Italy’s Foreign Minister Paolo Gentiloni echoed Kamel in comments to parliament on Feb. 18, stressing that ISIS poses “a grave threat” to European security. “[I]f this was even partially exploited and developed strategically, pandemonium could be wrought in the southern European states and it is even possible that there could be a closure of shipping lines and targeting of Crusader ships and tankers,” he warned. Speaking to MintPress, Kamel noted that Western powers failed to recognize the level of the threat that ISIS has come to pose not just to the Middle East and North Africa (MENA) region, but to the world. “ISIS has thrived on instability and it will look West to expand its dominion. We need to act globally to defeat the terror militants’ agenda and counteract their territorial advances,” Kamel said. While politicians and officials on both sides of the Atlantic are fixating on neutralizing the new “Libyan terror threat,” several political experts, including Philip Eliason and Anthony Biswell, feel that although ISIS poses an aggravated threat to Libya and the region, realities on the ground might dictate that the group’s strategic priorities are more geared toward consolidating their regional positions than opening up new fronts with the West. “Although ISIS might of course seek to increase its visibility in Europe by conducting lone wolf attacks and thus further drive a wedge in between Western society and Muslims to increase its recruitment pool, it is likely the group will, however, prefer to reserve its resources to preserving those territories it holds under its control,” Eliason, of Philip Eliason and Associates, a consulting firm based in Malta that specializes in policy design, government affairs and training, among other issues, told MintPress. Eliason is working as a consultant for the United Nations, advising on conflict mitigation and counterterrorism issues in view of mapping out and facilitating Libya’s political transition and empowering its state institutions. “Interestingly, Libya’s fall to ISIS appears but a repeat of Iraq, Syria and Afghanistan — all of which saw heavy U.S. military intervention and all of which saw, at one point or another, millions of dollars poured toward the funding of West-backed militias,” Adnan Al-Raheji, a political analyst specializing in radical movements and a journalist at the Yemen-based independent news website Khabar, told MintPress. “It appears once again that those so-called moderates Washington and Western powers have been so keen on enabling and empowering have fed the very terror monster we were told they would destroy,” he continued. 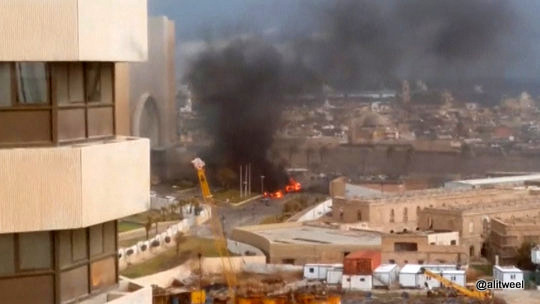 The moments shortly after the blast, when flames rose up from outside the hotel, appearing to be from the aftermath of the car bomb. A group affiliated with the extremist Islamic State claims a deadly and fairly complex attack on a Tripoli hotel _ indicating an expansion of the group’s activities to a chaotic North African state on the cusp of Europe and suggesting a level of coordination with its core in Syria and Iraq. The arrival of ISIS in Libya has been more insidious than its arrival in other parts of the MENA region — namely, Iraq and Syria, where terror militants have scored a series of grand military victories, powered by foreign patrons. Yet ISIS has nevertheless managed to impose itself as a Goliath among Libya’s many factions and militias. “It is in the midst of such chaos and politico-institutional void that ISIS came to be. Terror militants recognized the power which laid in chaos and overlapping agendas. They saw in Libya another Syria, another Iraq, to add to their growing caliphate,” Al-Raheji said. Eliason, who is observing developments on the ground in Libya, believes ISIS exploited Western powers’ oversight and eagerness to entrust certain individuals with running the transition of power. “Both the U.S. and the EU believed that Libya’s designated elite would transition into a thriving democracy. They mostly failed to recognize that Libya was not ready to be left to its own device,” he said. Libya currently has two governments jostling for legitimacy: the internationally-recognized government, based in the eastern coastal town of Tobruk, and the Islamist-backed General National Congress (GNC), based in the capital, Tripoli. In perfect symmetry, ISIS appointed two emirs: the emir of Tripoli, a Tunisian national known as Abu Talha, and the emir of Darna, a Yemeni national who goes by the nom de guerre Abu Al Baraa el-Azdi. Earlier this month, Mohamed Eljarh, a Libyan analyst and non-resident fellow with the Atlantic Council’s Rafik Hariri Centre for the Middle East, warned that ISIS is using failed states across the region to expand the group’s territories in line with its hegemonic ambitions. 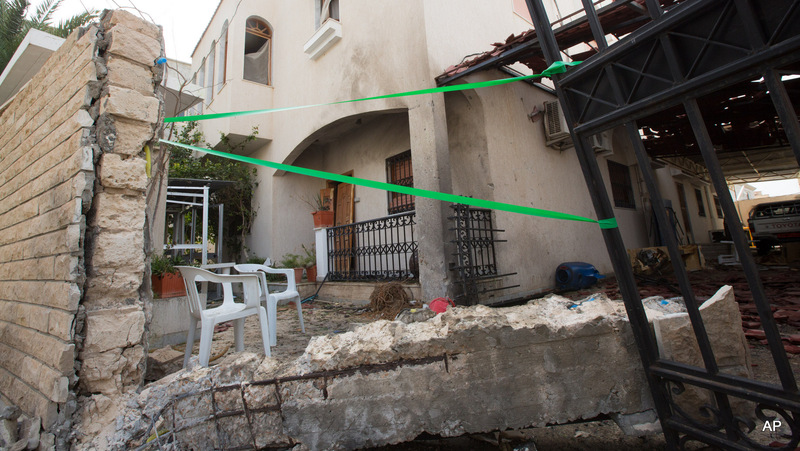 Police tape secures the Iranian ambassador’s house after it received minor damage from an improvised explosive device placed among garbage bags, in Libya’s capital, Tripoli, Libya, Sunday, Feb. 22, 2015. Though the arrival of ISIS onto the Libyan scene has been portrayed as a new development, it certainly wasn’t unanticipated. Many had warned U.S. officials that arming and financing unknown outfits in the MENA region would end in disaster. 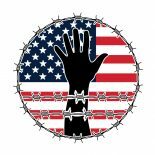 Michael Shank, adjunct faculty at George Mason University’s School for Conflict Analysis and Resolution, also expressed strong reservations toward America’s tendency to arm mercenaries across the region in view of preventing a repeat of Afghanistan’s drawn out military expedition. Indeed, as of February, ISIS was, if not in control, in a strong enough position that it could taunt Western capitals and lay claim to Libya’s vast oil resources, as its militants have launched coordinated military campaigns against the country’s oil fields. On Monday, hundreds fled as ISIS fighters clashed with Libya Dawn forces over the weekend in the coastal city of Sirte, the hometown of ousted dictator Gadhafi and one of the country’s biggest oil ports. As of Tuesday, Brigade 166, which is comprised of forces from at least six militias from the city of Misrata loyal to Libya Dawn, was still leading the clashes against alleged ISIS militants just outside Sirte. “By attacking the oil sector in Libya, they will ensure that any unity government will be deprived of much of the funds they need to buy the weapons they need to face this group,” he added. 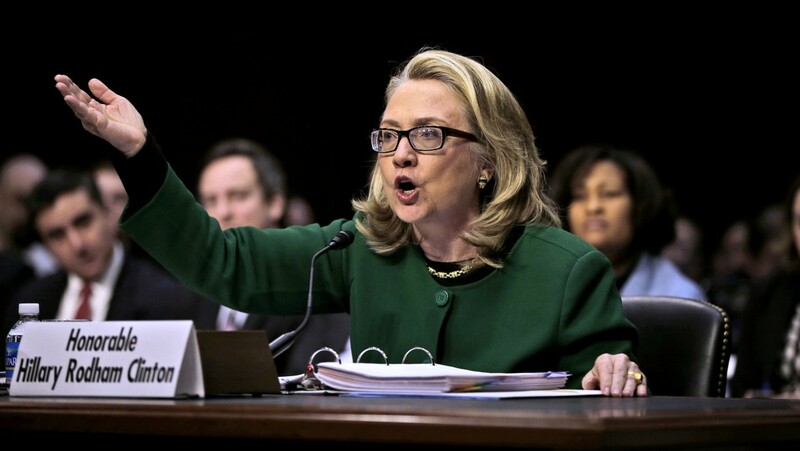 Secretary of State Hillary Rodham testifies on Capitol Hill in Washington, Wednesday, Jan. 23, 2013, before the Senate Foreign Relations Committee hearing on the deadly September attack on the U.S. diplomatic mission in Benghazi, Libya, that killed Ambassador Chris Stevens and three other Americans. Photo: Pablo Martinez Monsivais/AP. Adnan Al-Raheji, the political analyst from Yemen, believes that America’s counterterror policy leaves something to be desired. “Although the U.S. built a formidable counterterror infrastructure on the back of 9/11, U.S. officials are still mistaking ISIS for al-Qaida, assuming that the same tactics can apply to its destruction,” he told MintPress. As Al-Raheji noted, while al-Qaida remains a grave threat to world security, the threat posed by ISIS is even greater still. Thus, a new strategy should be devised. More troubling, he warned, is the fact that ISIS has managed to hold Western powers’ hostage to their fears. “The West has failed to understand that ISIS is hyping up the threat of terror attacks on European soil to further isolate Muslim communities throughout and ensure that more disillusioned youth will buy into its jihadist propaganda,” he asserted. Ahmad Barqawi, a freelance columnist and writer, argues that it was actually Gadhafi who first foretold Libya’s fate when he accused revolutionaries of being nothing but pawns of al-Qaida. This entry was posted on March 19, 2015 by conspiracyanalyst in International News, Middle East, North Africa, Proxy / Covert Wars, War & Peace and tagged Iraq, ISIS, Islamic State, Libya, Syria.